Godzilla finally opens in theaters this weekend after months of hype and a few incredible trailers. The truth is, I have no idea if this is a Godzilla movie, or the idea of what a modern blockbuster should look like. Godzilla is a character who does not need too much introduction, as he (her?) is now a part of international folk lore. 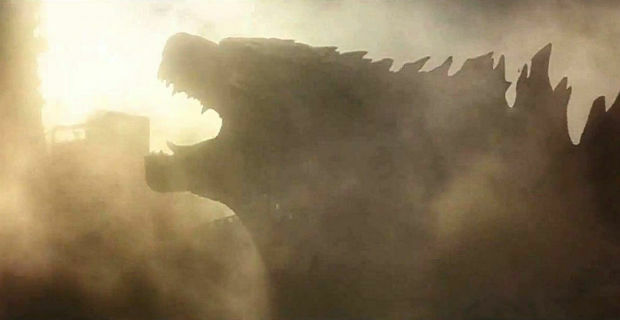 While there is never a bad time for a giant Japanese monster to cause some chaos, Godzilla is a product of nuclear fallout, an issue that is maybe a little less scary and timely than it might have been during post-World War II or post-Chernobyl. It takes a lot to make a mutant lizard boring, but somehow Godzilla manages to accomplish this feat. It all starts with one power plant meltdown in Japan that kills a lot of people, and drives one man, Joe Brody (Bryan Cranston), mad. He is the only one who seems to sense an imminent danger. Of course, nobody listens to him, because this is a movie, and in movies crazy people are always right, but nobody ever listens to them. Like all of the other great parts of Godzilla, Cranston is criminally underused here. He gets to do a lot of yelling, but not enough to justify his immense talent. Godzilla was heavily marketed on having a large “human aspect.” While there are a lot of people in Godzilla, none of them are particularly interesting or well thought out. For once, I would like to see a giant monster movies with a character who isn’t a scientist or a member of the military. Godzilla wants to have a heart, but it wouldn’t know what to do with that heart even if it had it. For instance, if Ford Brody (Aaron Taylor-Johnson), Joe’s estranged son, just wants to see his family again, then why does he keep running away from them every time they are finally reunited? While you can focus on the human aspect all you want, Godzilla should be a character, too. After all, this monster, and not the soldiers and scientists, is the legend here, though it feels like the giant lizard from the sea is barely even a factor here. Godzilla is a Godzilla movie without Godzilla. In a movie like this, buildup is usually key. According to the horror movie law that was established by Jaws, Monsters are typically scarier when we can hear them before we see them. While we can hear Godzilla before we see him, not much happens during that buildup period. Director Gareth Edwards does not create any tension during this time. No stakes are defined whatsoever. Perhaps CGI is making it too easy to complete a film without these essential elements. The long, dull lulls made me appreciate the likes of Super 8 and Pacific Rim, movies which I once thought I did not like. Sometimes, it feels like this version of Godzilla has no confidence in itself. It makes the viewers wait forever to get to one giant monster fight scene. Then, once it gets there, it immediately cuts away for more unnecessary exposition. When one particularly exciting scene is about to begin, the movie immediately cuts away to a war room. If Godzilla wants to live up to its promise of humanity, then maybe it should spend less time with the strategizing generals and more time showing the actual damage on the ground. There are moments when Godzilla actually delivers, and when it gets to the stuff that you paid money to see, it is great. That greatness is fleeting, though. To watch Godzilla is to watch a monster movie without heart, soul, or Godzilla. Movies like this make me feel cynical about the future of movies. I really wish this was about Godzilla, and not those giant grasshopper things. While Godzilla was a good guy and a protector of humanity in earlier versions as well, it seems self-defeating to make a movie that’s an allegory on the dangers of nuclear radiation yet make the victim of said radiation a force for good. I did not like Pacific Rim when I first saw it. After seeing Godzilla, I decided to watch it again, and I realized that it had all the heart, humor, and monster fights that Godzilla wished it had. More directors should be as excited about what they make as Guillermo del Toro is. Ken Watanabe basically has the same facial expression for everything that happens here. Except for the skydiving scene, the 3D here was basically pointless. I watched the 1998 version of Godzilla in preparation for the 2014 version of Godzilla. It is awful for its own set of reasons. In the 1998 version, Godzilla has babies and lays those eggs in Madison Square Garden. The Chrysler Building is blown up for no reason whatsoever. Jean Reno yells about French coffee. Ferris Bueller drives a car into Godzilla’s mouth. It is so dumb, yet so much fun to watch. Sometimes, that’s all you can ask for in a movie about a giant mutant sea lizard. This entry was posted in Uncategorized and tagged Aaron Taylor-Johnson, Bryan Cranston, Elizabeth Olsen, Gareth Edwards, Godzilla, Ken Watanabe, Movie Review, Summer Movies on May 19, 2014 by ian0592.